Less than a week after unifying the heavyweight crown, UFC president Dana White has officially given champion Brock Lesnar his next assignment. 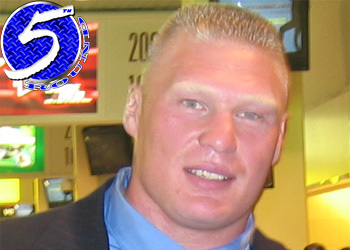 The promoter told MMAFighting.com late Friday night that Lesnar will meet Cain Velasquez at UFC 121 on October 23rd. The show will jump off from inside the Honda Center in Anaheim, California. UFC 76 in September 2007 was the last time an Octagon was seen in The O.C. It was initially rumored the two would tango at UFC 119 in the organization’s debut in Indiana, however White quickly dispelled those rumors yesterday by awarding the Nogueira brothers with the top two slots in the September 25th event. Lensar became the world’s top heavyweight after his dramatic come-from-behind victory over Shane Carwin inside the MGM Grand Garden Arena in Las Vegas. The submission win bumped his pro MMA record to a dominant 5-1. Velasquez, who earned his top contender status by putting down Antonio Rodrigo Nogueira at UFC 110 in February, was sitting front and center this past Saturday to witness the heavyweight unification bout. Despite having only six bouts under his bling-bling belt, half of Lesnar’s scraps have been of the championship variety. That percentage will surely increase after what he showcased at UFC 116, as the former WWE superstar appears to only be scratching the surface in regards to his reign. No other bouts have been confirmed or rumored for the event at this time.